Three Wellsprings of Leadership® is a book about authentic Leadership – that is, leadership characterized by the ability to consistently display those creative leadership skills and leadership styles, which flow from an understanding of the bedrock sources of Leadership. This top book on leadership is not another how-to-be-a-leader-book, or one of the many leadership books which suggest that you must fully possess numerous character traits in order to be an authentic leader. In discussing the Wellsprings of Character, Hope, and Imagination, the author touches briefly upon psychology, philosophy, ethics, and education as they are related to authentic leadership. 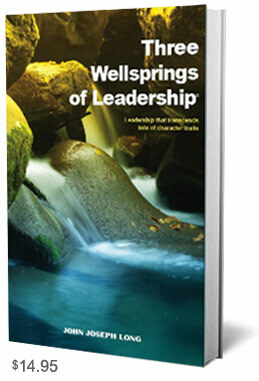 The message of the Three Wellsprings of Leadership is distinguishable not only from those leadership books that advocate the character-traits-list-approach to leadership, but also from the newest leadership approaches, including those described in Leadership 2.0 (Bradbury, Travis and Greaves, Jean; a book which promotes a strategy for increasing 22 core and adaptive leadership skills), and the idea of “Servant Leadership” (proposed by James L. Davis; an approach based on leaders who lead by first serving, and who care about people). Neither of those approaches addresses the sources of leadership. Leadership 2.0 presents a list of skills (which sound like character traits) allegedly necessary for successful Leadership, and “Servant Leadership” seems to take an aspect of leadership to a semantic extreme. The endorsements for the book make it clear that it will rank among the best leadership books available. 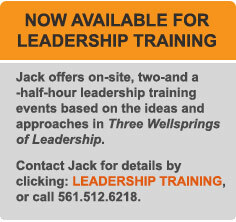 “Three Wellsprings of Leadership highlights one of the crucial ingredients of leadership. . . IMAGINATION. This insightful analysis teaches that IMAGINATION is as important to leadership as sugar and flour are to the baking of a cake. Simply put, IMAGINATION presents an escape from the drag of doing things “the traditional way.” It is the freeing of oneself from the bounds of experience and the ever-present naysayers who are imprisoned by their own limited experiences. IMAGINATION pulls the leader toward new solutions and new approaches to the complexity of today’s problems. A leader without IMAGINATION is a follower. Brendan V. Sullivan Jr. is recognized nationally as one of the best known and most able trial lawyers in America, with an extraordinary record of successes. He is a senior partner in the Washington, D.C. law firm of Williams & Connolly. The National Law Journal regularly lists him as among “America’s One Hundred Most Influential Lawyers” and in 2010, listed him among “The Most Influential Lawyers of the Decade” (2000-2009) in litigation. Ed Colodny has served in many leadership roles during his career, including Chairman & CEO of US Airways, Interim President of the University of Vermont, Interim President of Fletcher Allen Health Care, and Chairman of the Board of Trustees of the University of Rochester. Richard Tarrant is founder and chairman of Chrispus Venture Capital, a private fund that owns companies in healthcare (Marathon Health), renewable energy (Plasma Power), and internet technology (HRSentry). Previously, he had co-founded IDX Systems Corporation, a leading healthcare technology company. At the time of its acquisition in 2006 by GE Healthcare, IDX employed more than 2,500 people and its technology was deployed in over 80% of America’s academic medical centers. Rich, along with his wife Deborah, founded the Tarrant Foundation, whose mission is to use technology to more effectively engage middle and high school students. Jack McMullen heads the Cambridge Meridian Group, Inc., a strategy consulting firm to Fortune 500 and technology-oriented companies, taught Business Strategy at Harvard Law School, served on the Board of Directors of three public and twelve privately-funded companies, is chairman of Ethan Allen Institute, a free market think tank, and was the Vermont Republican nominee for the U. S. Senate in 2004.